Jewish life flourished in Vilnius during the interwar years and Yiddish literature was no exception. 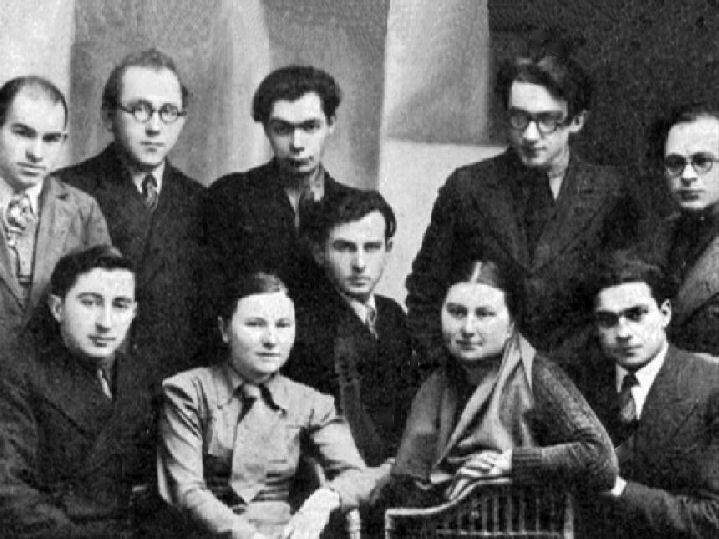 A number of young writers and artists came together and formed what was to be an important Yiddish literary group called Yung Vilne ("Young Vilnius"). This group, which existed between the years 1927 and 1943, committed itself to political activism as expressed through their work. The members included Avrom Sutskever, Khayim Grade, and Shmerke Katsherginski. A famous poet Moyshe Kulbak (1896-1937) also created in Vilnius. The Holocaust and subsequent Russian occupation broke apart the group, but those who survived continued their professional careers throughout the world. Front row, left to right: Elkhonen Vogler, Benzion Mikhtom, Khayim Grade, Yoysef Opatoshu, Shmerke Katsherginski, and Avrom Sutskever. 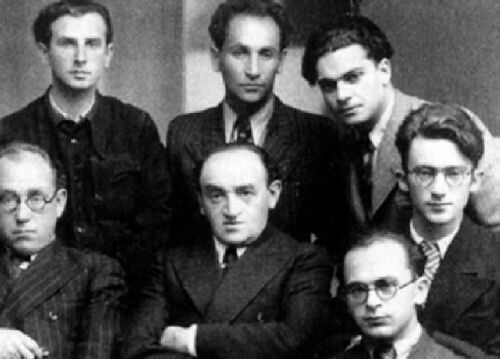 Back row, left to right: Leyzer Volf, Shimshon Kahan, Peretz Miransky, and Moyshe Levin. Other members included Hadase Rubin (1912 Frampol-/poet) and Hirsh Glik (1920-/poetry), artists Leib Castle and Rafal Chwoles. 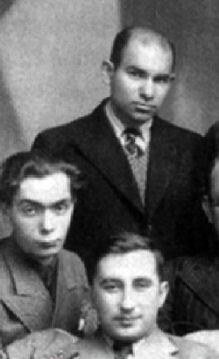 Standing, right to left: Shmerke Katsherginski (1908-1954/writer), Avrom Sutskever (1913-/poet, Elkhonen Vogler (1907-69), Khayim Grade (1910-82/poet) and Leyzer Volf (1910-1943). Leyzer Wolf was killed in a village near Samarkand, Uzbekistan in April 1943. Seated, right to left: Moyshe Levin (1907-1941), Sheyne Efron (artist), Shimshon Kahan (-1941), Rokhl Sutskever (1905-1943/artist) and Benzion Mikhtom (1909-1941/artist). Moyshe Levin, Benzion Mikhtom, Shimshon Kahan and Reina Sutskever (mother of Avrom Sutskever; not a member of Yung Vilne) were all killed in Ponar in 1941. Katsherginski perished in a plane crash in Argentina on 27 Apr 1954. Rokhl Sutzkever (nee Ushayev; born in Smorgon, Belarus), died at Treblinka in 1943. The above photograph was taken in 1930.